The Jean & Joan Cancer Fund donated $37,500 to Beebe Healthcare toward the purchase of an additional transport van for patients of Tunnell Cancer Center. The money was raised at last fall’s 16th Annual Jean & Joan Cancer Fund Golf Tournament at the Kings Creek Country Club. Jim Martin, Jean & Joan Cancer Fund Founder and President, and Vicki Tull, Tournament Chair, presented the check to Cherrie Rich, RN, MSN, Executive Director of Oncology Services at Beebe Healthcare, and to Judy Aliquo, President and CEO of the Beebe Medical Foundation. 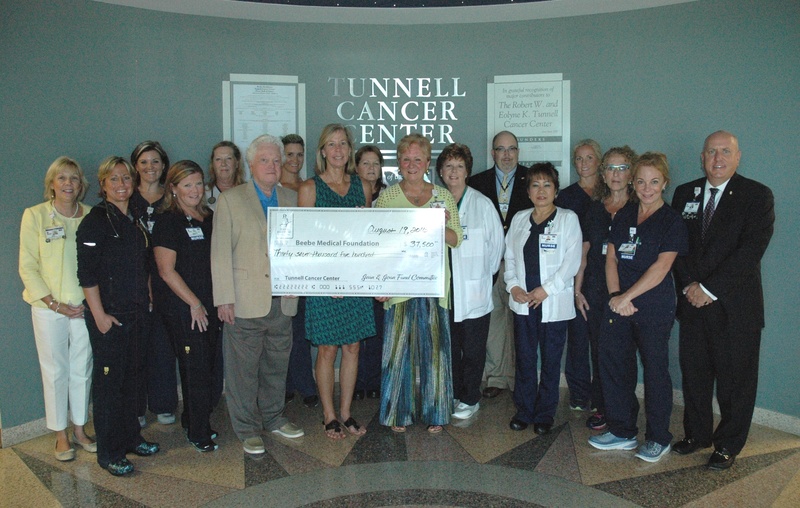 Since its founding in 1999, the annual charity tournament has enabled the Jean & Joan Cancer Fund to donate more than $452,500 from tournament proceeds to support patient care at Beebe’s Tunnell Cancer Center. The $37,500, together with funds to be raised from the upcoming 17th annual Jean & Joan Cancer Fund Golf Tournament on September 26, will be used to purchase a new van to make sure that all patients can receive their necessary cancer treatments. Each year, the tournament takes place a Kings Creek Country Club, and this year is no exception. The 17th annual event will feature a day of golf, silent and live auctions, a reception and dinner. Jeffrey M. Fried, President and CEO of Beebe Healthcare, will serve as Honorary Chairman. Major sponsors returning to support this year’s event include: SPI Pharma; Beebe Healthcare; and Movies at Midway. New sponsors this year are: Ocean Atlantic Sotheby's International Realty; and Accent on Travel. In 2015, the Fund donated $70,000 to Beebe Healthcare for the third 3D Mammography machine to support the early diagnosis and treatment of breast cancer. Over the previous years, Tournament proceeds allowed the Jean & Joan Fund to support patient care at Tunnell Cancer Center by purchasing three patient transport vans and other emergency and diagnostic equipment; to join the Center in creating a special “Patient Special Needs” fund; to fund construction of a scenic wall in the Tunnell Healing Garden; and to establish a library and center for fitting cosmetic and prosthetic devices for recovering cancer patients. Future years’ event proceeds will be dedicated to supporting Tunnell Cancer Center’s future expansion. To register a foursome for the September event or for more information, please contact Lesley Carr at (302) 644-2900, or visit the Fund’s website at www.jeanandjoanfund.org. Pictured here, left right right, Judy Aliquo, President and CEO of Beebe Medical Foundation; Jessica Jarecki; Brandi Carr; Kim Ennis; Deb Crowell; Jim Martin; Leks Howard; Vicky Tull; Michele Fletcher; Cherrie Rich, Executive Director of Oncology Services at Beebe Healthcare; Kathy Marks; Rick Schaffner, Vice President/Chief Operating Officer of Beebe Healthcare; Beth Ondrus; Jordan Warrington; Suzanne Vazzano; AnneDee Conway; Tom Protack, Vice President of Development for Beebe Medical Foundation. Beebe Healthcare is a not-for-profit community healthcare system with a charitable mission to encourage healthy living, prevent illness, and restore optimal health for the people residing, working, or visiting in the communities we serve. It offers services throughout Southern Delaware including a 210-licensed-bed hospital, a cancer treatment center, and outpatient facilities at multiple sites providing walk-in care, lab, imaging, and physical rehab services. For more information, please visit us online at www.beebehealthcare.org.